My wife Kathy and I recently spent eleven days in Italy, primarily in the historic and cultural center of Tuscany, which is Florence. The plan was that I would do several paintings on location as well as research for larger pieces to be created back in my Virginia studio. 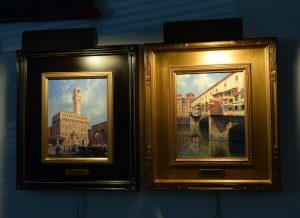 These pieces were painted while working directly from the subjects. The “Impressionists” who left their studios in the 19th century to paint in nature began this practice. The French called this style of working in the open air “plein aire painting”. It is characterized by more gestural attempts to capture the transient nature of light and atmosphere of a subject as opposed to extraneous details. The pieces have a more expressive and lively aspect. 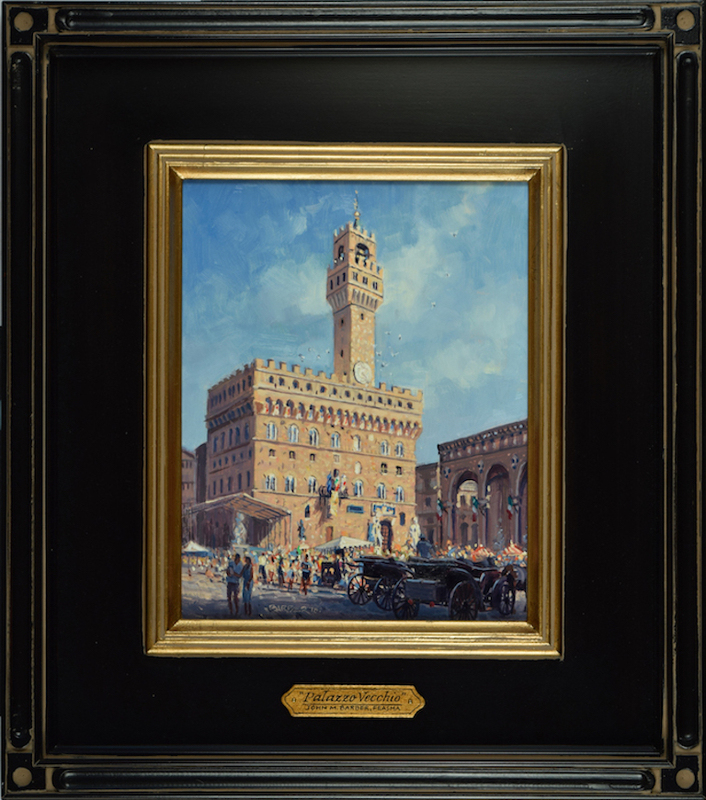 The first full day I spent about five hours at my travel easel in the large square of the Palazzo Vecchio. This is a magnificent site in the historic district near the river Arno. Meaning the “Old Palace” the fortress was built at the turn of the 14th century and served as the meeting place for the Priori of Florence and even today the city council still meets there. The painting was done working directly from the subject. Later in the trip, I toured the immense structure that is filled with artwork and furnishings from the medieval period. The view from the crenelated battlement atop the tower offers a magnificent view of Florence, especially the vast Gothic Cattedrale di Santa Maria del Fiore often called the Duomo. Oil on artboard 8” x 10” Overall framed 15” x 17” $2,500.